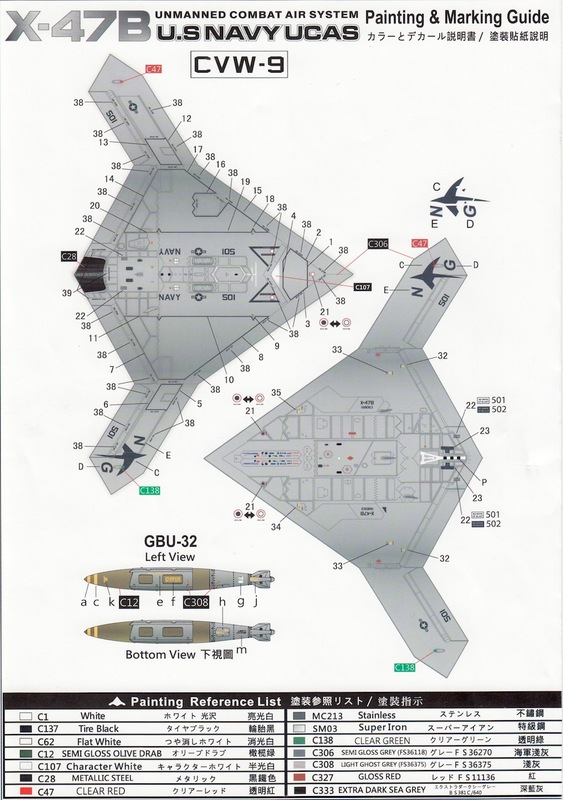 Northrop Grumman X-47B UCAS - Build Review Pt II. Available through Freedom Models Distributors Worldwide. 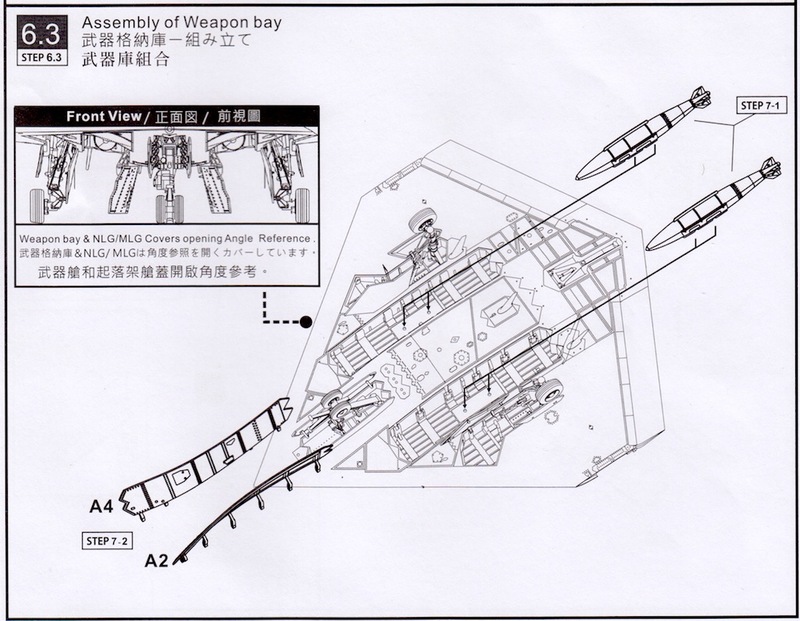 Steps 6.1 thru 6.3 relate to the assembly of the model with the bomb bay open. I have seen several builds done this way but as I wanted to reproduce the carrier trials configuration of the aircraft this did not interest me. 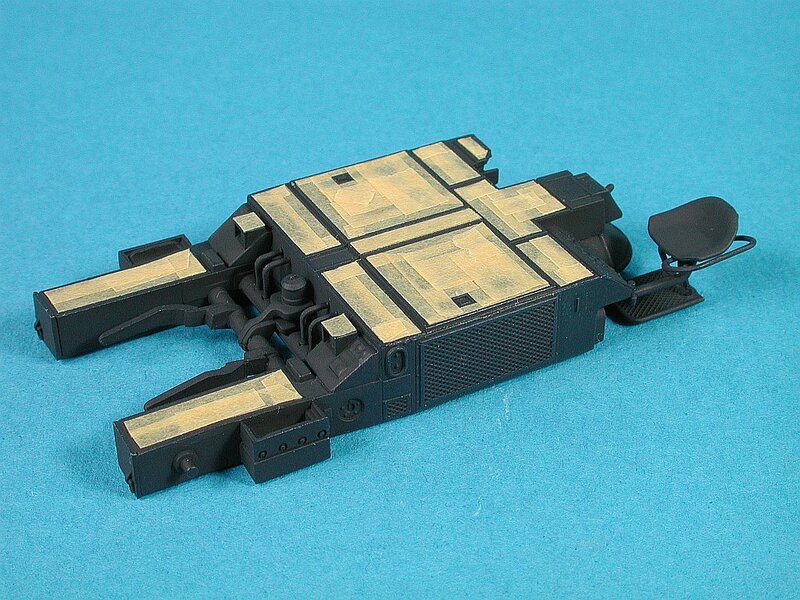 The kit provides two GBU-31 JDAMs and the doors can be fitted to the bay in the open position. 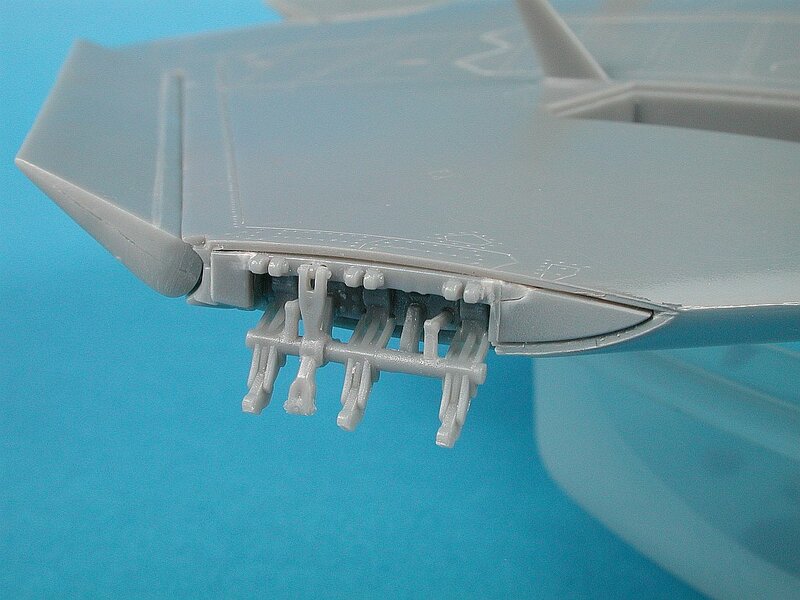 The bomb bay itself has some basic ribbing detail provided. 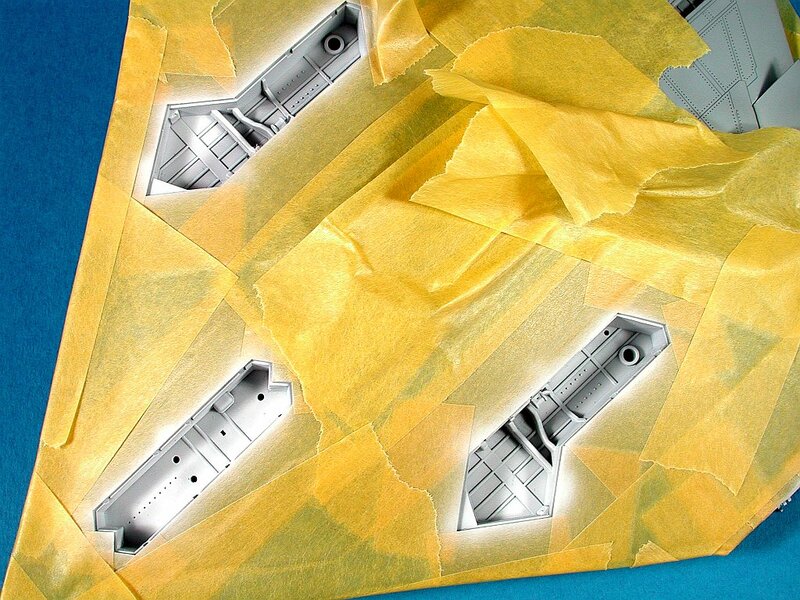 Step 7 covers the upper fuselage assembly (mostly antennae) and for those that do not plan to fold the wings, this will be the final assembly step. One thing to be mindful of when attaching the antennae is that they all need to be aligned to the part of the fuselage that they sit on. For the antenna on the centreline, they sit perfectly vertical, for those on the curve sections they need to sit vertical to the curved surface etc. This means the antennae are not symmetrical so make sure you check your reference photos or they will look odd. 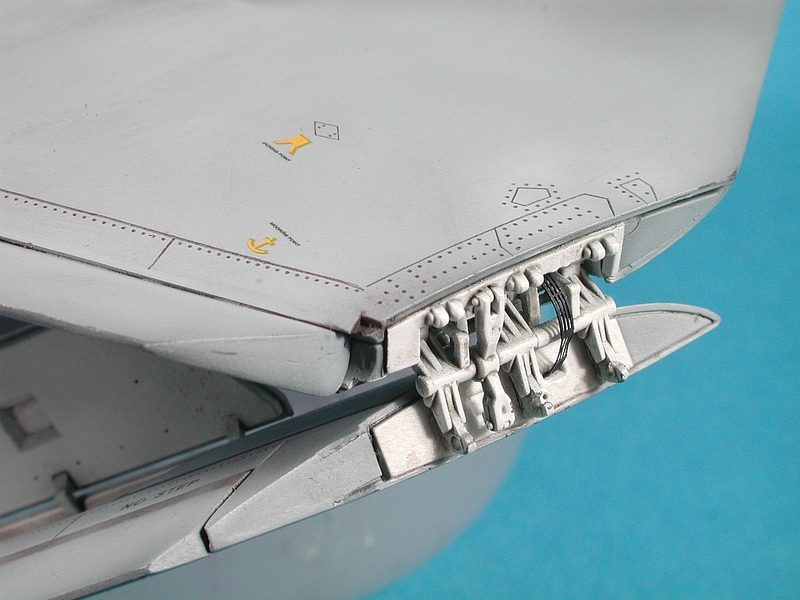 I also added some small punched discs to enhance the kit round antenna on the spine. These need to be raised off the surface and 15 thou card seemed about right to my eye. 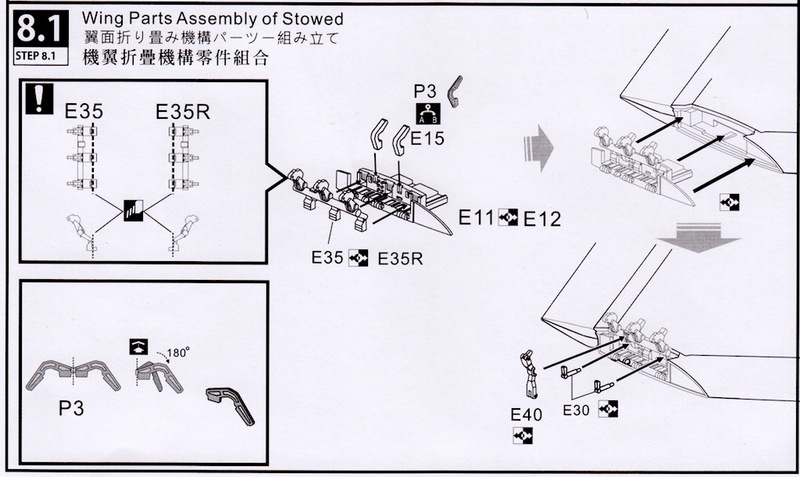 Step 8.1 is only used if you decide to fold the wings (like me). 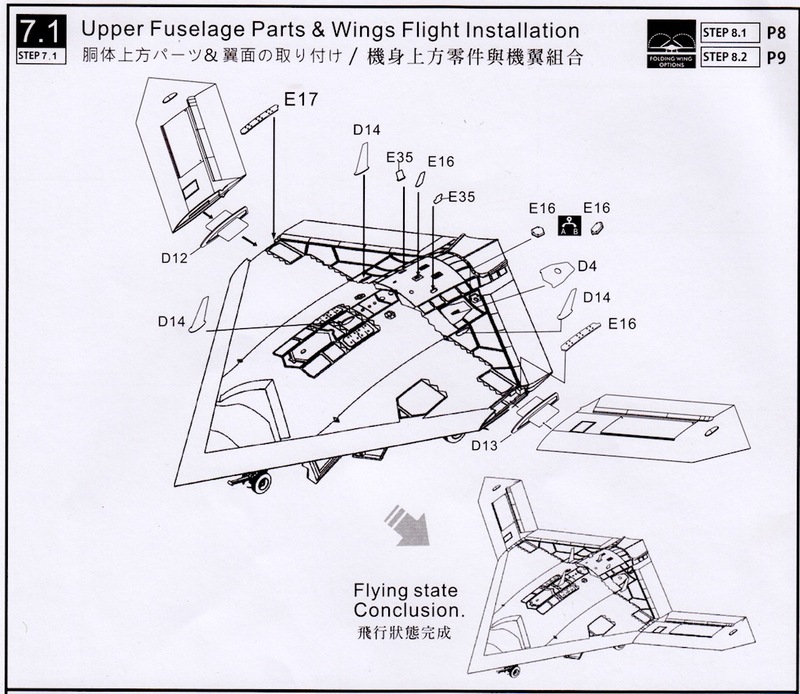 The wing fold provided by Freedom is quite detailed and the icing on the cake is the addition of a PE part for the flexible ribbon cabling that runs between the two wing parts. 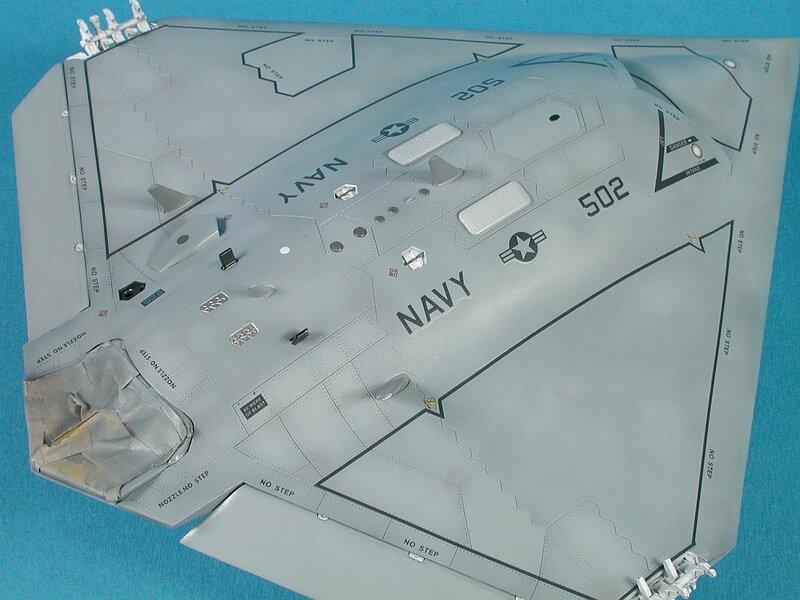 The wing fold on the X-47 is fairly simple and Freedom have captured pretty much all the detail you need in a 1/48 model. A little trimming and shaping was needed to get a glove tight fit of the wing fold parts in the wing but I wanted this to be tight so a strong bond was formed with glue. 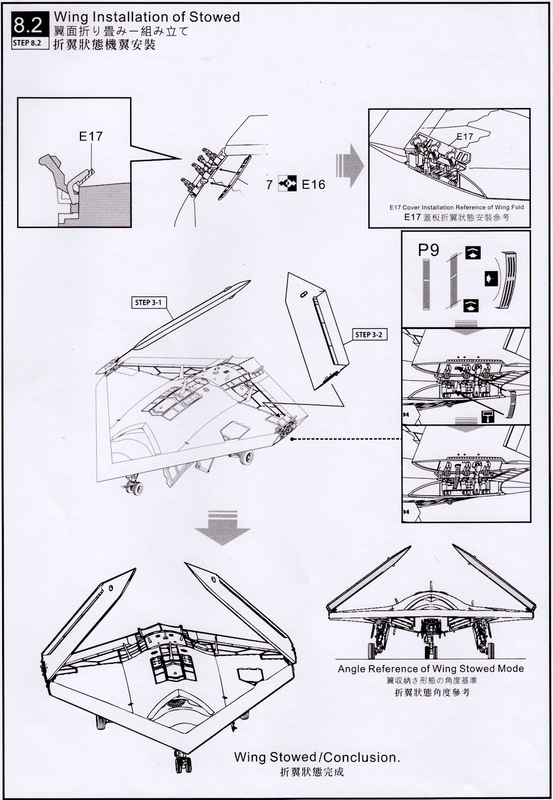 This is the port wing fold. 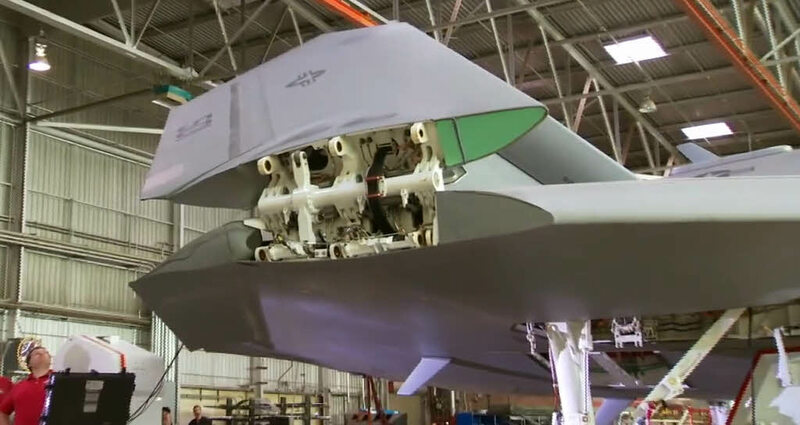 The one thing I would have liked to see was longer fingers on the three mounting points so they extended deeper into the folded section of the wing/ this would offer more strength and a more positive attachment point. The same wing fold (port) as seen from the bottom. 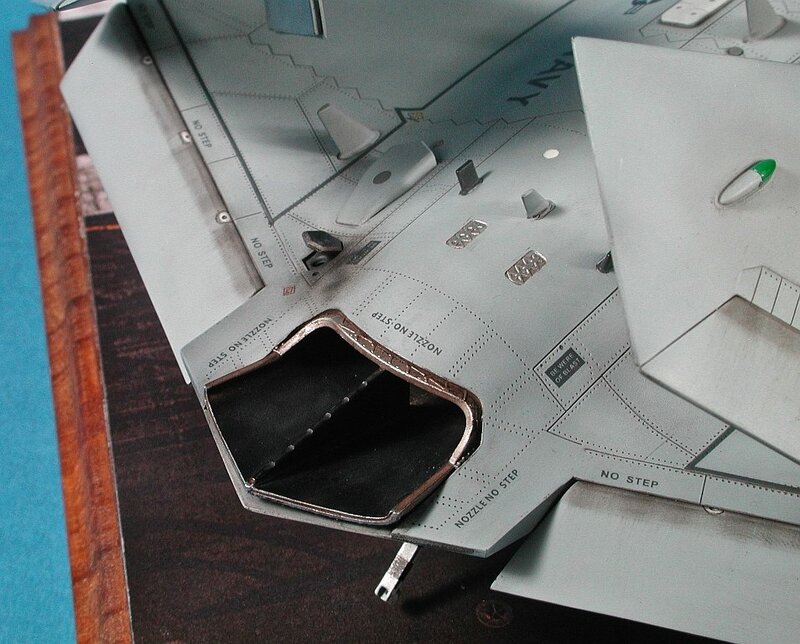 Once glued into the wing the parts are very strong. Despite my misgivings in the end the wing fold was more than string enough when I attached the wingtips using super glue. Step 8.2 is the final step in the kit assembly. I left the wing tips off until the very end and they were in fact the last thing I attached the finished model. 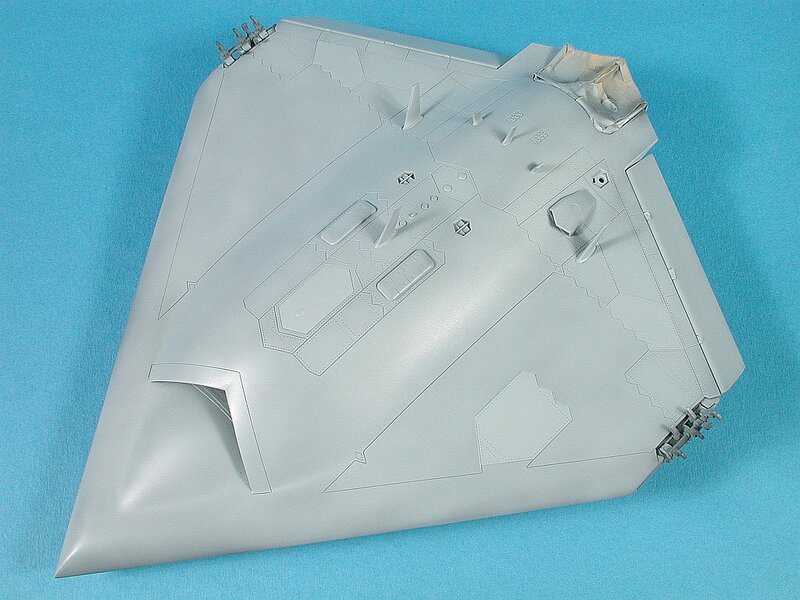 The completed wing fold viewed from the bottom. 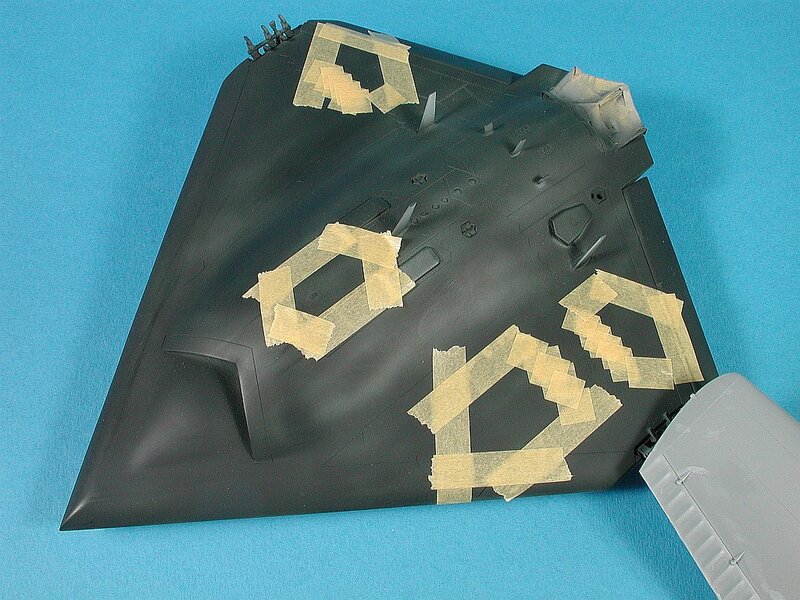 Note the fine photo etch wiring ribbon between the two wing sections. Tamiya White Primer was again used and a light wash of Davy's Grey oil paint to highlight the detail and give a slightly grimy appearance. 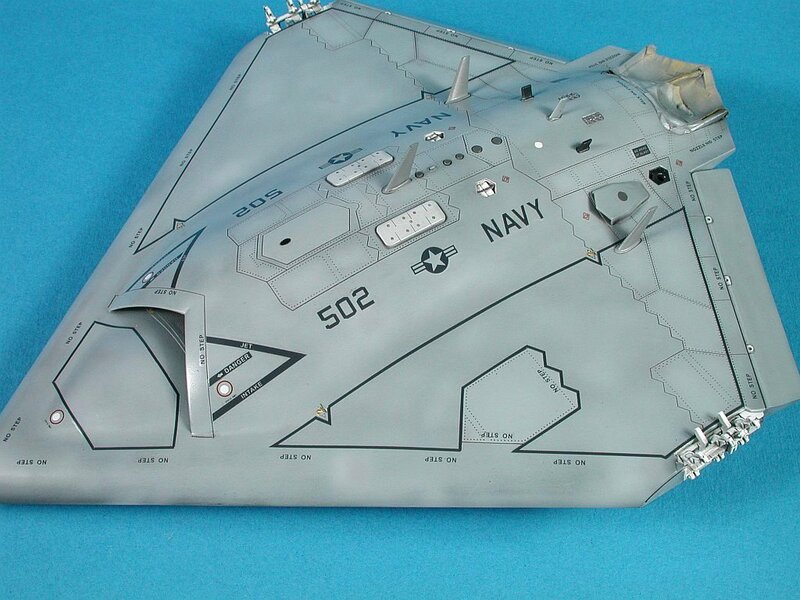 You can paint the X-47B any colour you want as long as it’s USN Light Ghost Grey. Like most aircraft in the lo-viz area we need to get creative with our painting lest we end up with a bland, lifeless grey hunk of plastic. It's quite a challenge actually and I have tried most of the methods to try and achieve that almost elusive "realistic" look on my models. Like all creative endeavours in life you never really master it (well most of us anyway) and I certainly continue to try new things in search of the perfect result. 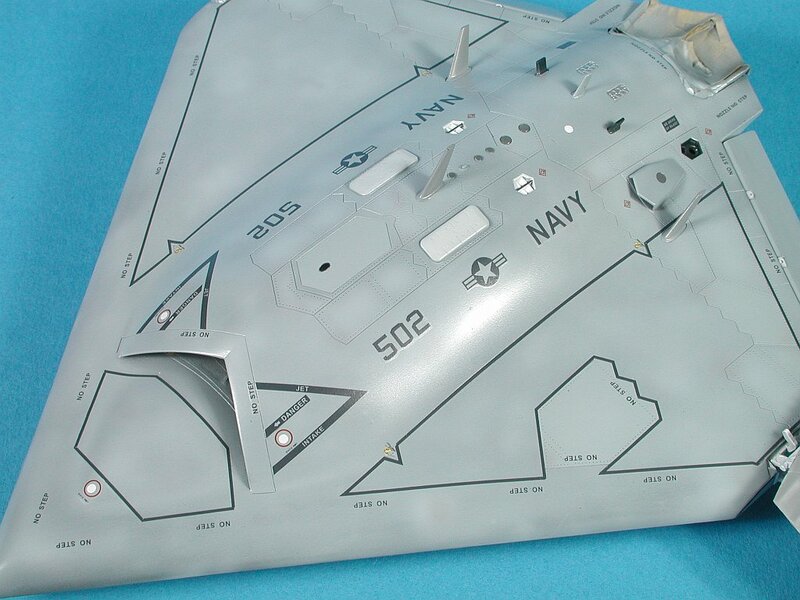 Freedom Models have provided us with markings for both X-47B evaluation airframes (501 and 502) as well as a bunch of alternate carrier air wing options for those wanting to have a crack at a what-if scheme. With the assembly complete and the intake and exhaust masked off its time for a coat of primer. My favourite primer is Alclad Grey Primer. A quick check for any blemishes is made before moving onto the next paint layer. 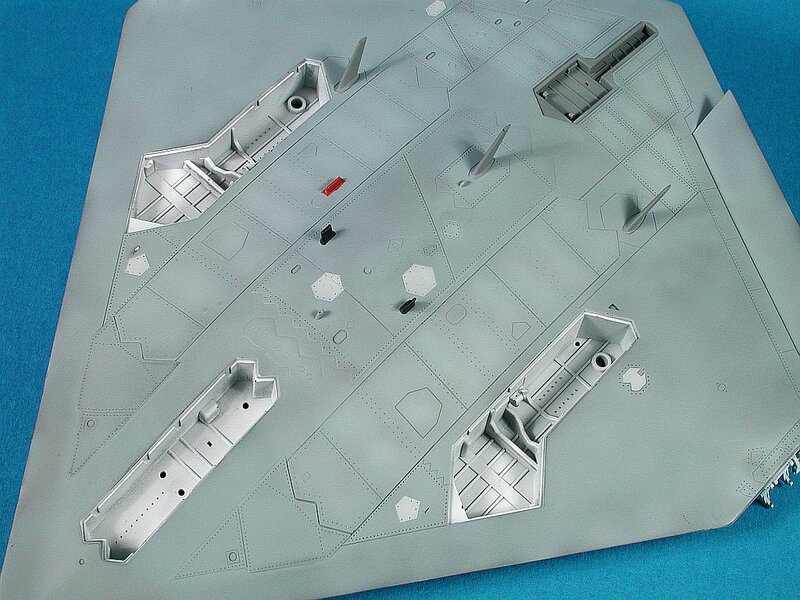 The bottom also received a coat of grey primer. 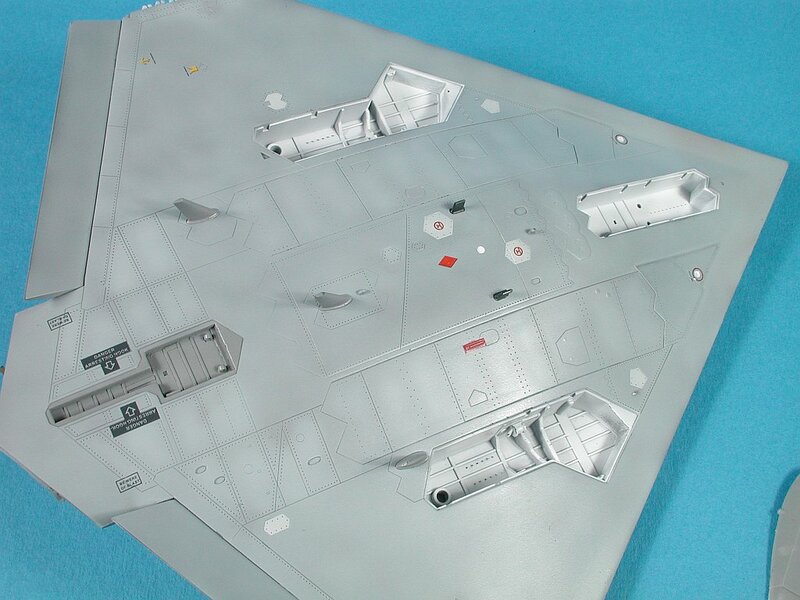 I paid particular attention to the area around the bomb bay doors where I had done some sanding and re-scribing. 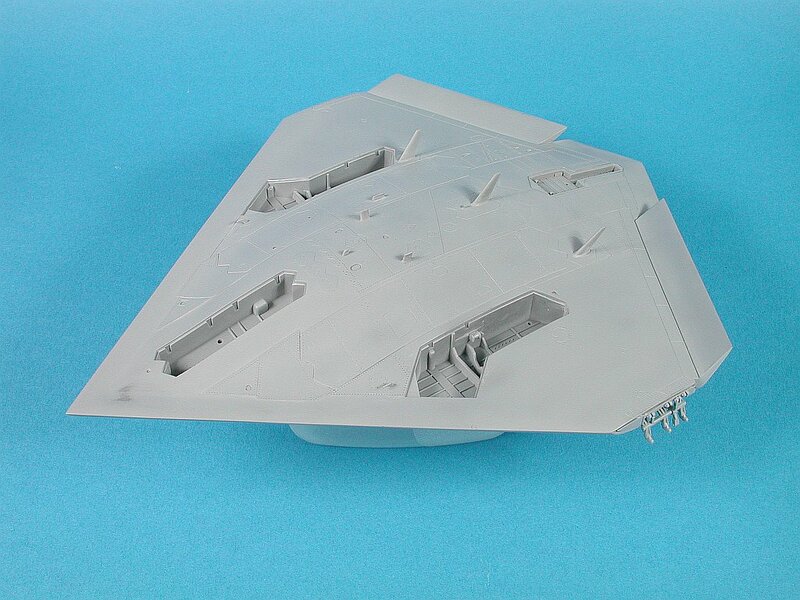 As I had done just recently with my F-15DJ I decided to use a black base coat over which the light grey top coat could be built upon. For this coat I have used Tamiya NATO Black thinned with Mr Color Levelling Thinners which helps produce a lovely smooth finish. As I was applying the top coat of Mr Color C306 as per the Freedom instructions two things happened. 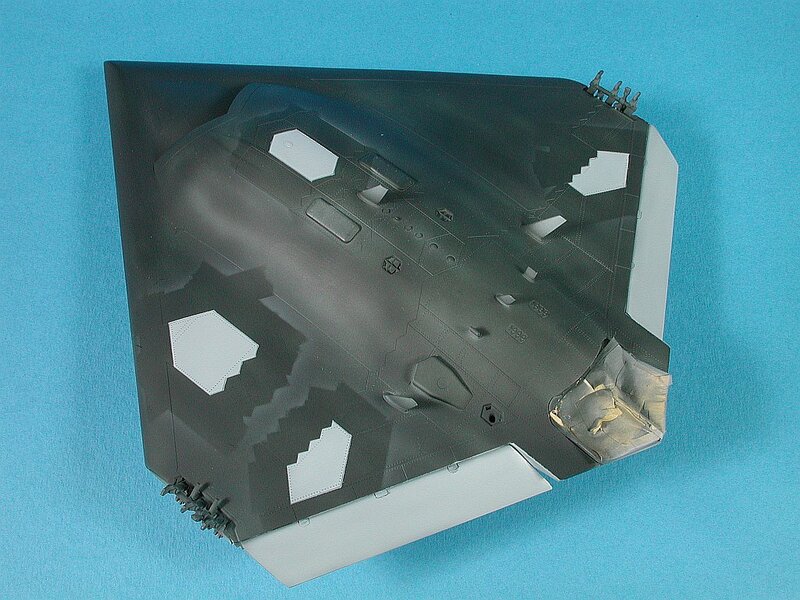 Firstly I decided that C306 was too dark when applied over the black and perhaps it was because I was not paying attention that I managed to spill the contents of my airbrush colour cup onto the nose of the model. This made a mess of course (accompanied by a few choice words) and I quickly wiped away the majority of the liquid paint and then sensibly set the whole model aside to dry overnight. If I have learned one thing over the years it’s that you never try and "fix" anything to do with paint while it’s wet. Leave it alone, let it harden and then deal with it. Next evening, when the paint was dry it was time to attack it with some sanding pads. I took the paint all the way back to the plastic and then feathered the edges of the various paint layers in an effort to blend the whole thing together. 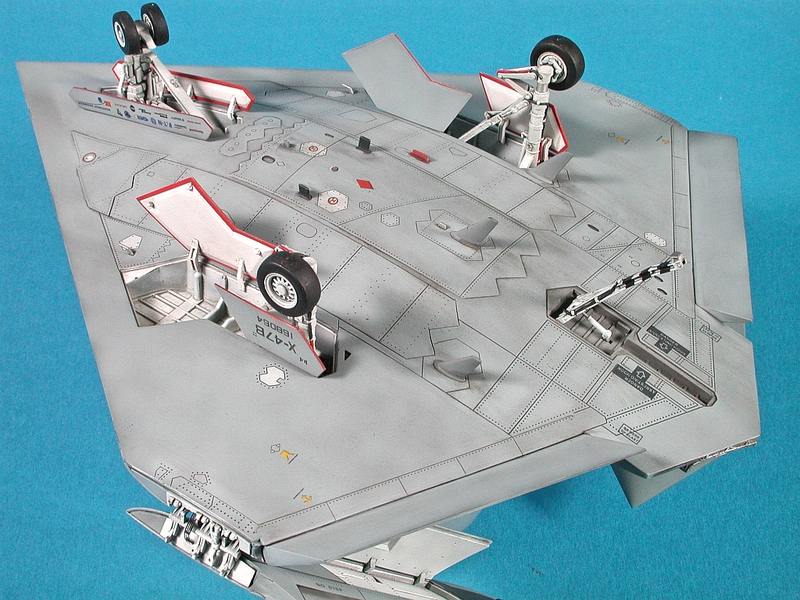 It did occur to me how lucky I was that this model was in fact a UAV with no cockpit because this mess would have ended up exactly on top of the cockpit otherwise. !! Back to square one, out with the Alclad Primer and another coat to check my work. I took the opportunity to reboot the top coat application as well by re-applying my black base coat. 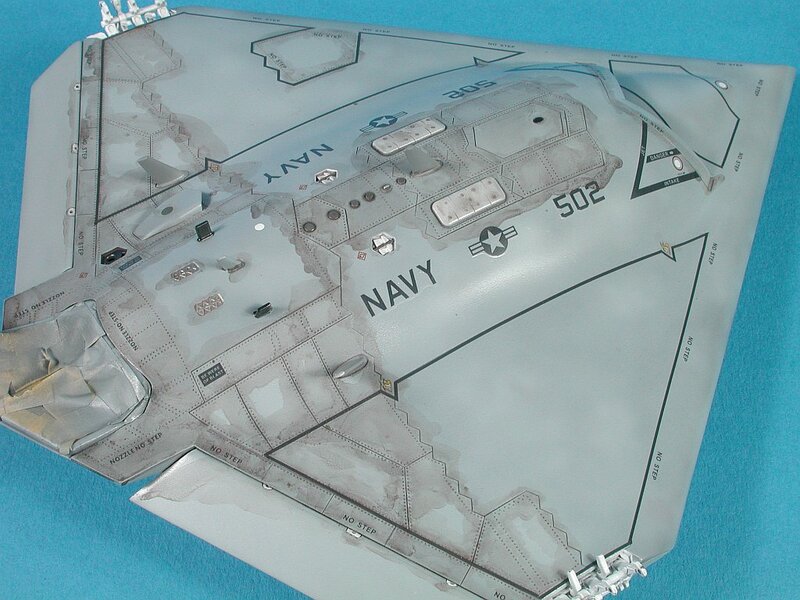 From looking at photos of the X-47 I noticed that certain panels were less grimy than others and it occurred to me that I could possibly reproduce this look by masking off these panels now and applying a base coat of the final C306 colour, not a lighter or darker colour but the actual top colour itself. So now we had the two tone base coat with black for the sections I wanted to be the most grimy and C306 for the panels I wanted to appear cleaner. Normally I would simply spray the top colour over the whole model and then post fade with a lightened mix of the top colour those selected panels but I like to try new things because you often surprise yourself and find a better (or alternate) way of doing things. Next up was the application of the Mr Color C306 coat. Although it’s subtle you can clearly see the effect I was going for with the "cleaner" panels. The photo does not show it very well due to the flash lighting flattening the model surface but the patchwork effect is more pronounced on the model than is evident here. 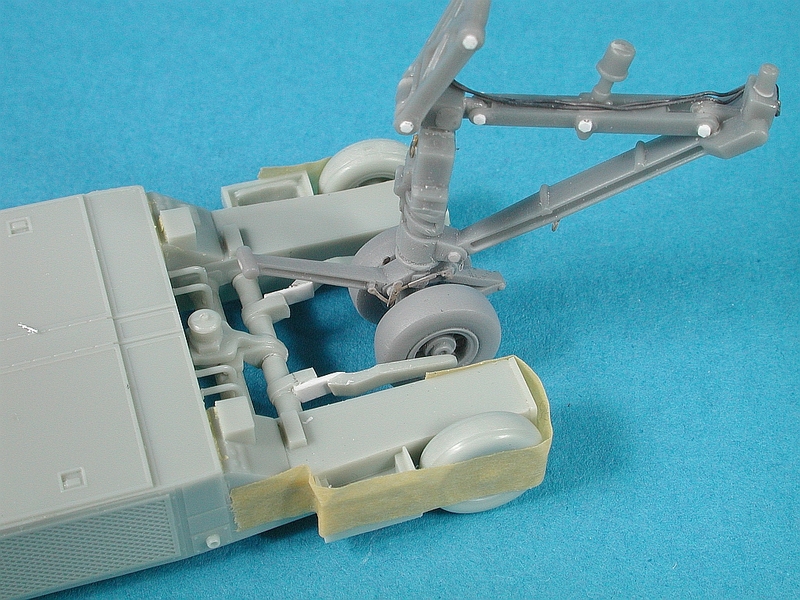 The wheel wells were now masked up and Tamiya White Primer applied. Wishing to create more variance in the paint finish I loaded up the airbrush with a very thin mix of C306 + White. 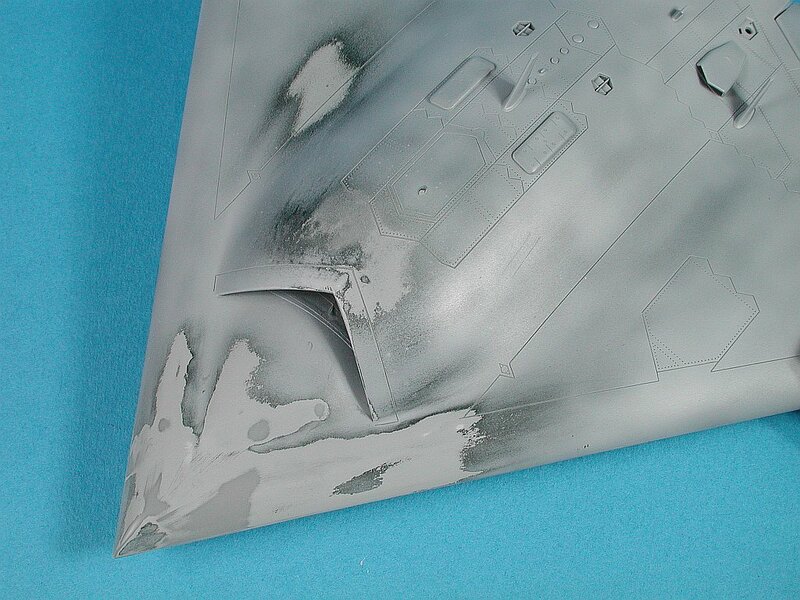 This was sprayed across the surface and particularly in the centre of panels to accentuate the fading effect. I next picked up a bottle of C307 (a different shade of grey) and used this to simulate random "repair" on the airframe as often evident on USN aircraft. 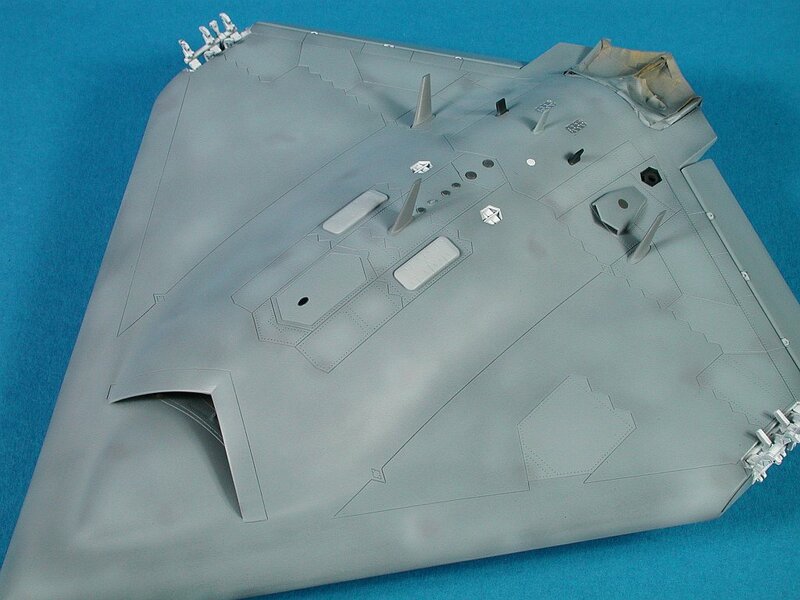 One I was happy with the overall effect I proceeded to mask up and paint the assorted lumps and bumps on the airframe including the wingfolds and antennae. Much like the upper surface the bottom received detail painting and restrained paint fading as this part of the airframe is less exposed the sun but it does get grimeier, which we deal with later on. At this point the painting was pretty much complete. 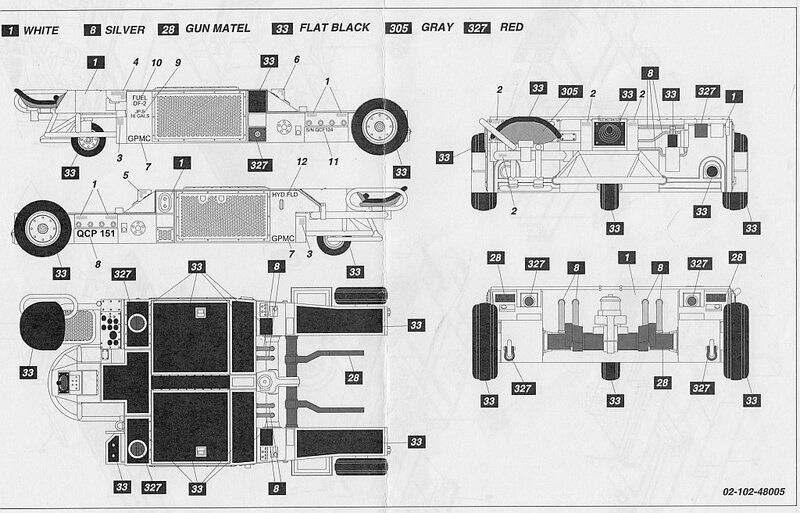 The decal sheet is quite comprehensive and accurate with several options available to the modeler. As mentioned previously I had already settled on making my model as close to the carrier trial configuration as possible. My only concern at this point was how thick the decals looked on the sheet. First step before any decaling occurs is to apply a thin coat of gloss clear. My preferred option here is Future floor polish. When airbrushing Future I normally thin with Tamiya Acrylic thinner as it gives me better control of the Future as it leaves the brush. When the gloss coat is dry decaling proceeded as normal. Unfortunately the decals not only looked thick on the sheet but were indeed quite thick once I started to put them on the model. 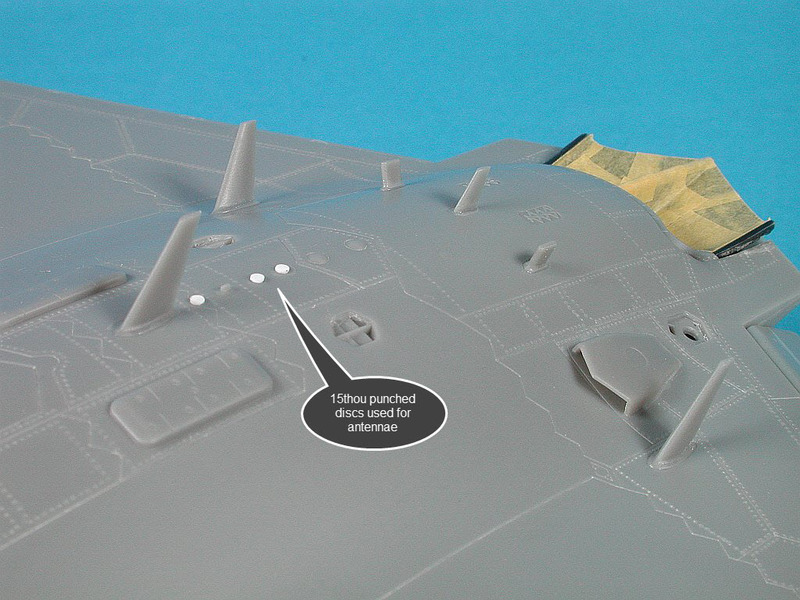 I therefore did as much as I could to remove any visible clear carrier film from around each decal, especially the larger ones on the wings and main airframe. 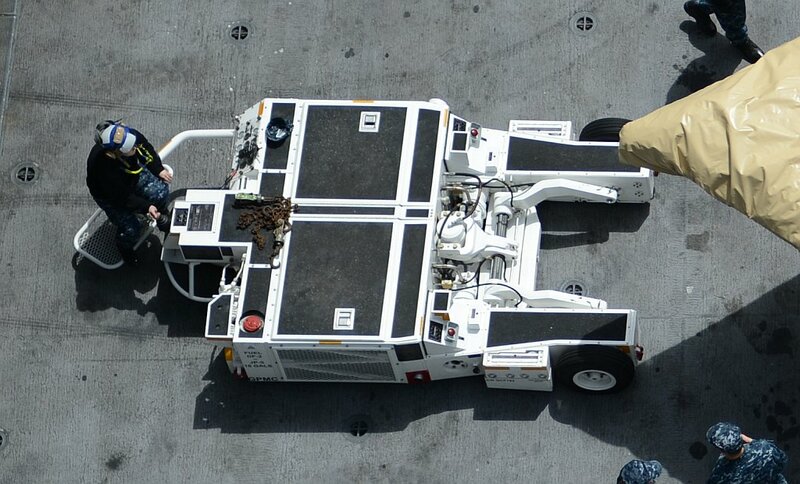 Another view of the completed topside decaling. Note the quite visibly thick clear carrier film on the NAVY decal closest to the camera. In hindsight I should have cut each letter from the decal and applied it separately to achieve a better result. Live and learn I guess. 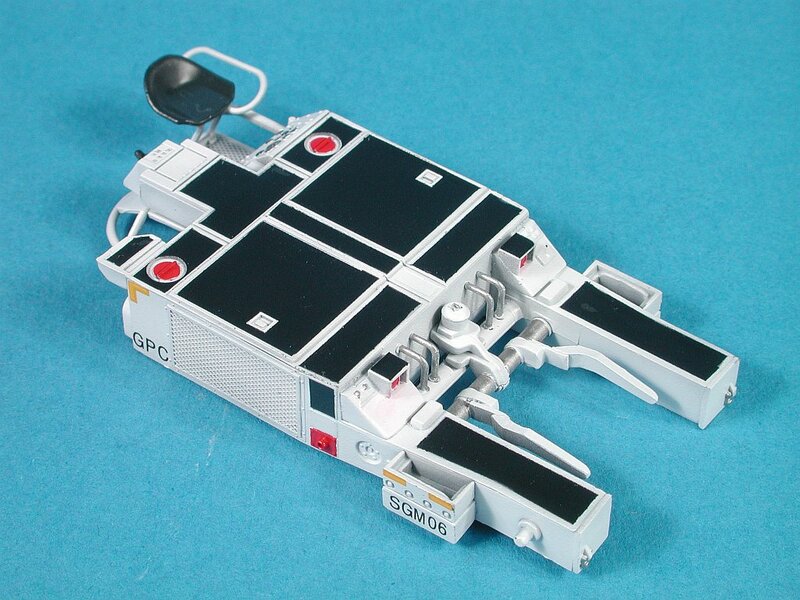 The lower surfaces have far less decals than the top (as is normal). Leaving the decals to set overnight it was time for a panel wash. Before the panel wash its an important step to seal the decals under another light coat of clear gloss. The panel wash I chose to use here was my normal Model Master Burnt Umber. If you would like more details on this technique I have written a "step by step" article here. The panel wash looks very messy at this point but have no fear it cleans off easily with a soft cloth dipped in white spirit. It’s important to select a panel wash colour that does not overpower the model surface as this becomes distracting to the eye. 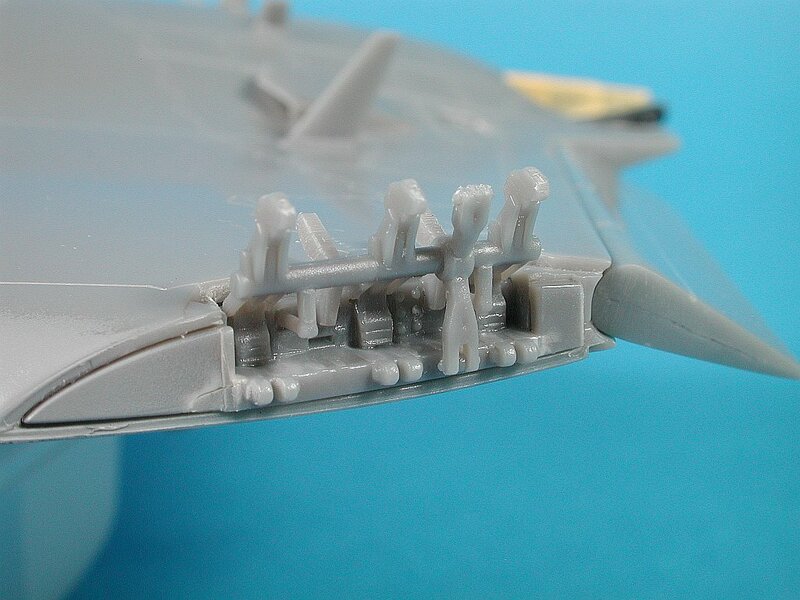 In the bottom of most aircraft you can go a bit harder with the wash and be less particular with the clean-up. The helps make the undersurface look grimier than the top. Note that I did not use this Burnt Umber wash in the white wheel wells or wing-folds, preferring instead to use a more subtle Davy's Grey oil wash later on. The home straight. The excess panel wash has been cleaned up and panel lines now look sharp and help bring the surface of the model to life. 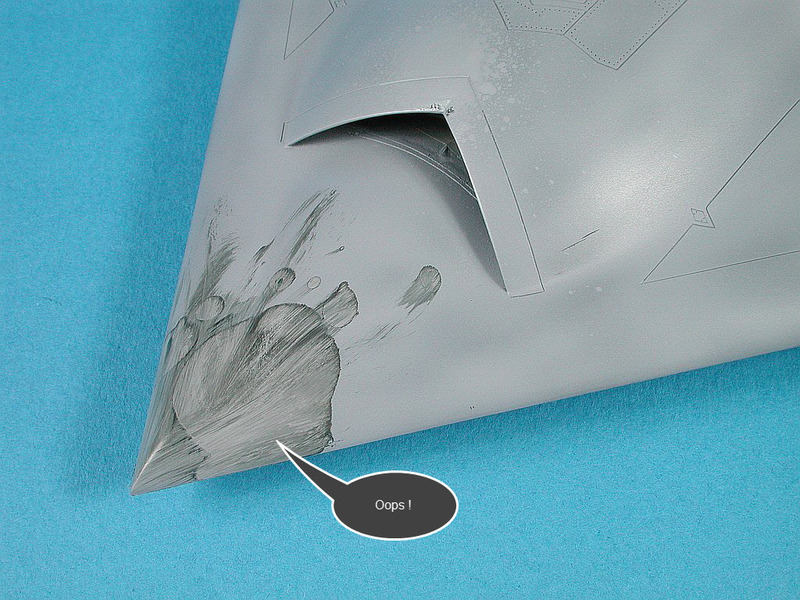 Many modellers don't like panel washes as they claim the real aircraft does not have visible panel lines or rivets. 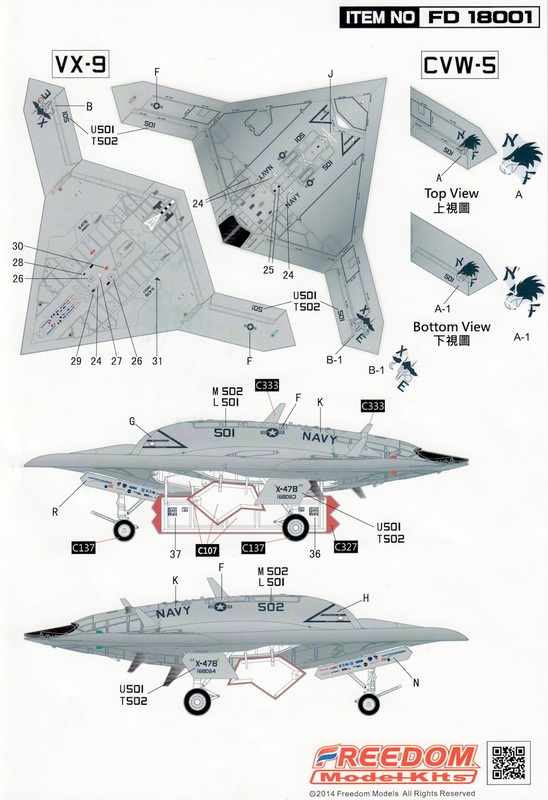 In the case of the X-47 that is not the case and almost any photos of the real aircraft show they have gotten quite grotty already. The bottom looks much busier now that we can see the panel and rivet detail. 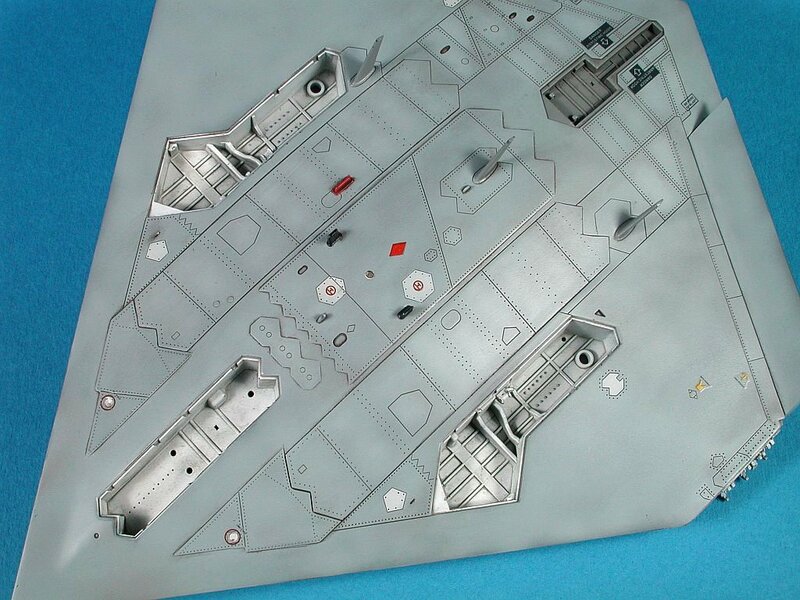 Once we have applied a final flat coat I will apply a light oil wash to make this section look dirty. Take note of the highlighting in the wheel wells. This is result of the very useful Davy's Grey oil wash which does an excellent job of reproducing shadow type effects on light colours like white. 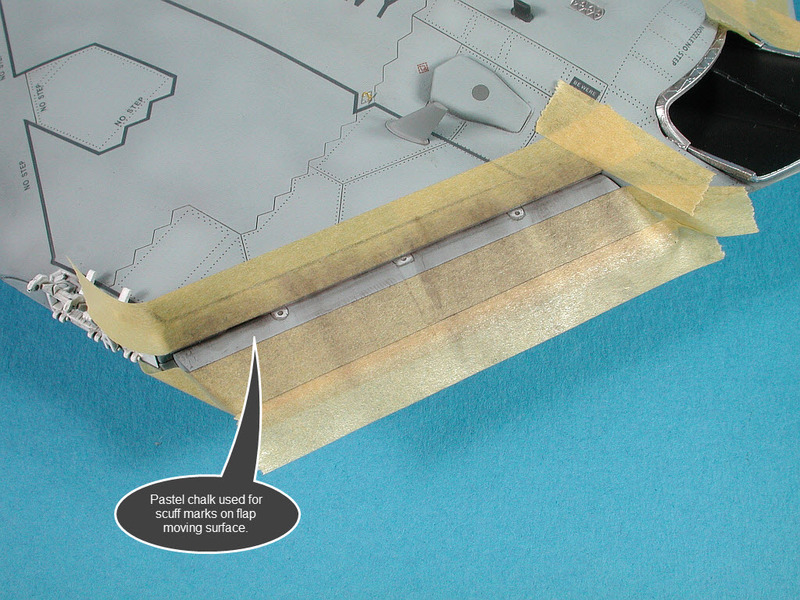 The last weathering task is to use some pastel chalk to reproduce the smudge marks evident on the flaps and ailerons. This looks to me to be the result of the flaps rubbing against seals inside the wing and is quite distinctive on all photos. 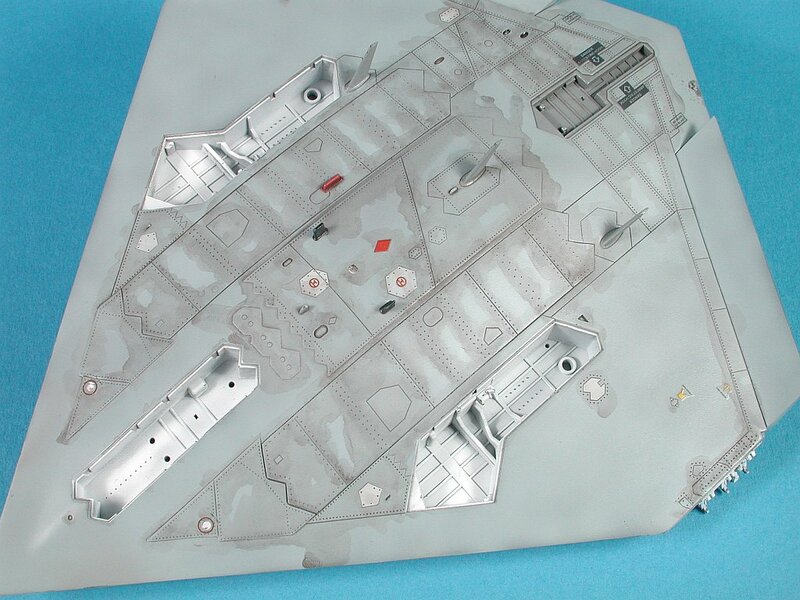 With the painting and weathering now complete the final task is to assemble the various sub-assemblies like wingtips and undercarriage. 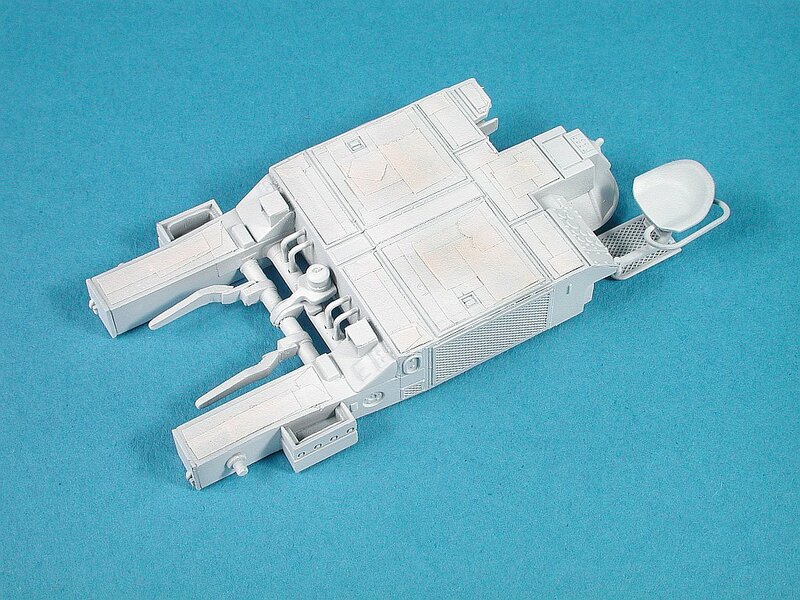 The following few photos show the completed model. 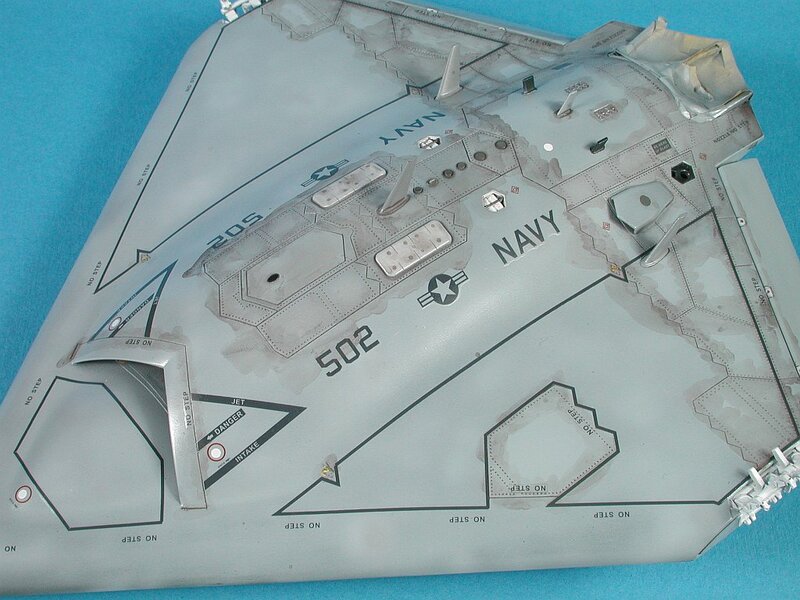 In addition to building the Freedom Models X-47B I also wanted to add some context for the aircraft with a small vignette base. I find that a couple of figures to give some scale and a suitable base is often all that is needed. 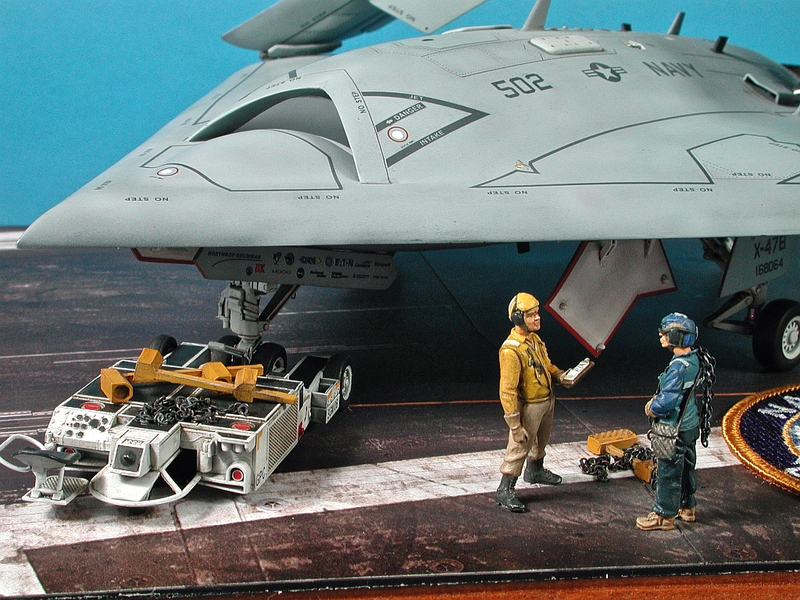 This photo gave me enough inspiration as I already had the SkunkWorks deck tractor in my stash and all that was needed was a couple of 1/48 deck crew figures. 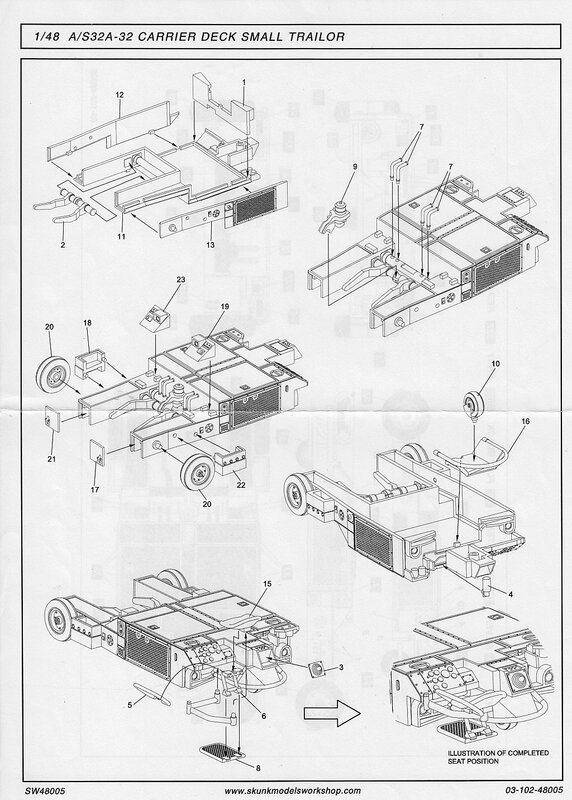 The deck tractor is a fairly simple machine and having good reference photos makes the task a lot easier when figuring out detailed colours and configuration for our model. 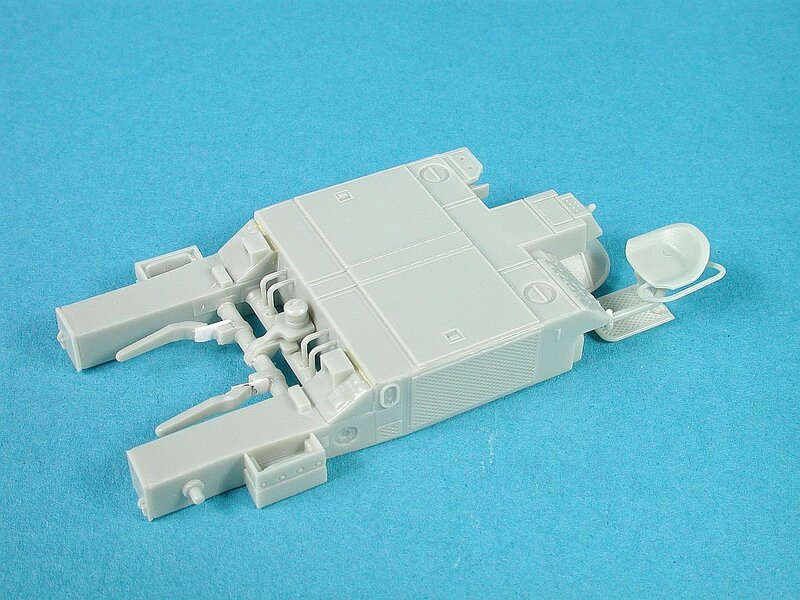 The Skunkmodels tractor is part of kit #48005 and readily available from LuckyModel. 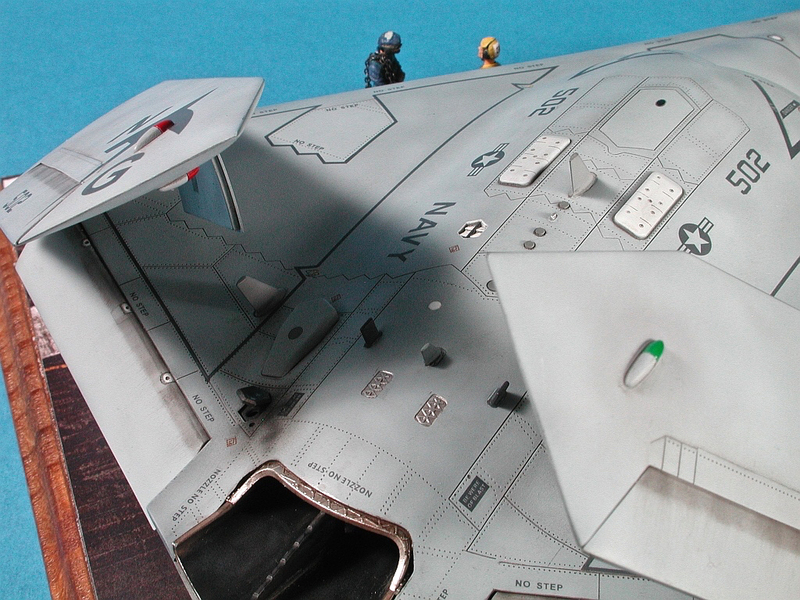 A small modification was need to the tractor to allow it to fit the X-47's nose wheel width. Some 20 thou card extensions allowed me to get the desired width and height without much fuss. Assembly of the tractor is trouble free and took about 20 mins in total. Painting instructions in the kit match almost exactly with the reference photos I had of this style of tractor. 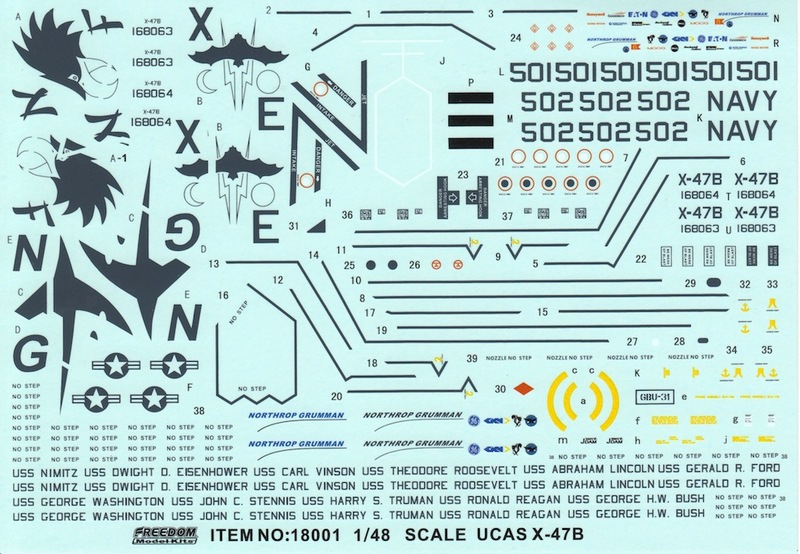 Stencil decals are also provided in the kit. 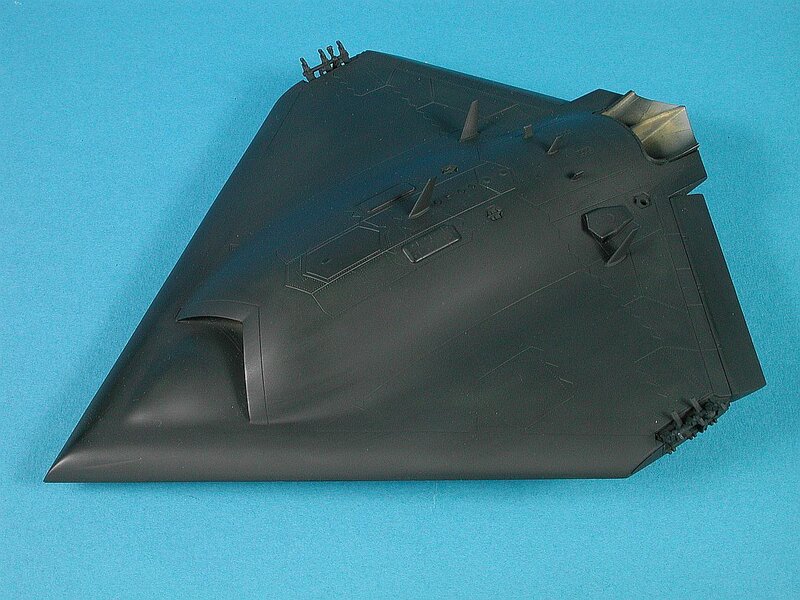 A coat of Tamiya NATO Black has been masked in preparation for the white top coat. 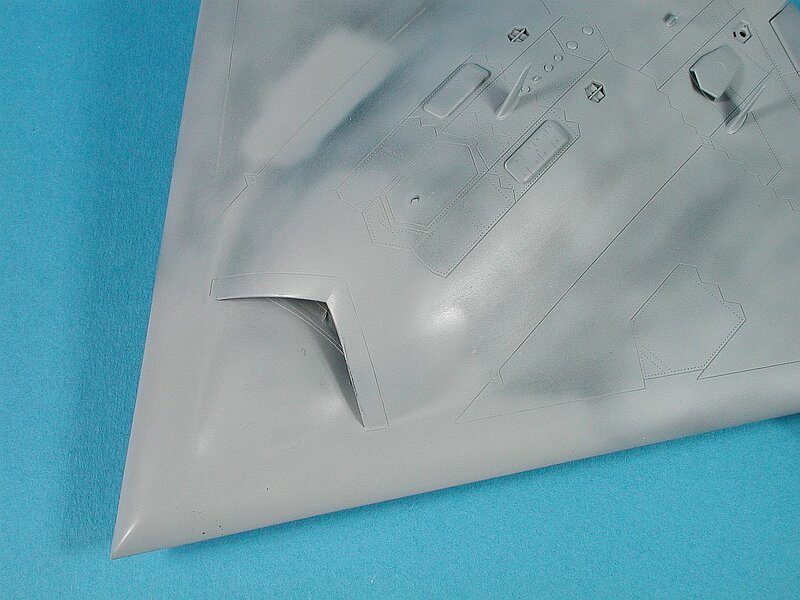 Tamiya White Primer covers the black easily and provides a durable finish for further weathering stages. Detail hand painting using Vallejo and Citadel paints has been completed and decals have also been applied. All that remains now is to dirty her up with some washes and add some accessories (chains and chocks). Figures are not my favourite modelling subject, however they are an important part of the overall result I am aiming for, so I do my best. 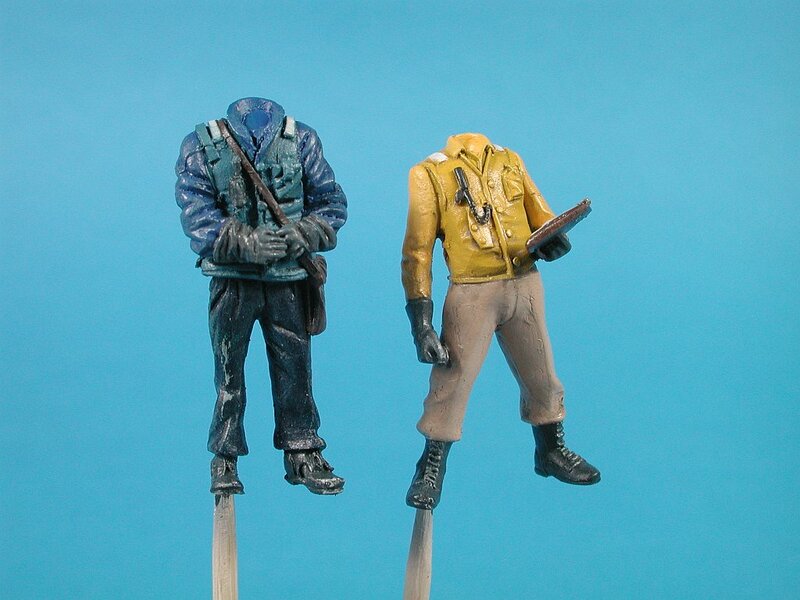 In this case I selected two figures, one from CMK and the other Verlinden. I've had the CMK figures for some time and never really liked the look of them, something was not quite right and I never managed to put my finger on why. 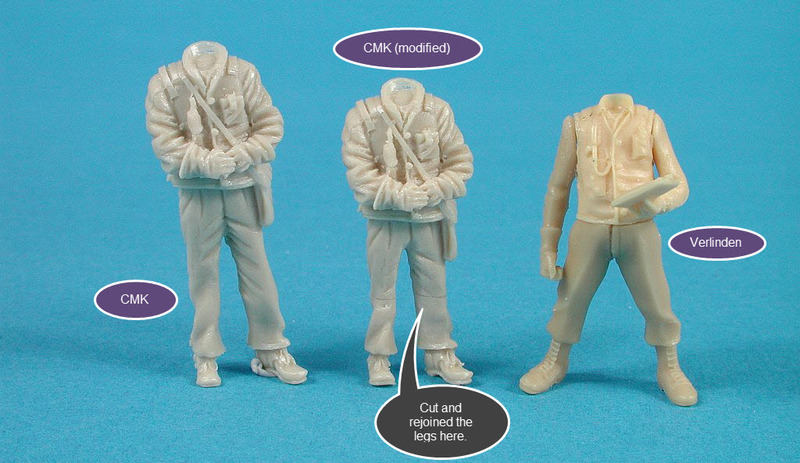 When I stood the CMK figure next to his Verlinden colleague it struck me that the CMK figures legs were out of proportion to his torso. To correct (or adjust) this I cut his legs and removed about 3mm and re-joined them. This made him look better and in proportion to the Verlinden figure. Painting is progressing mainly by hand with Vallejo acrylics. 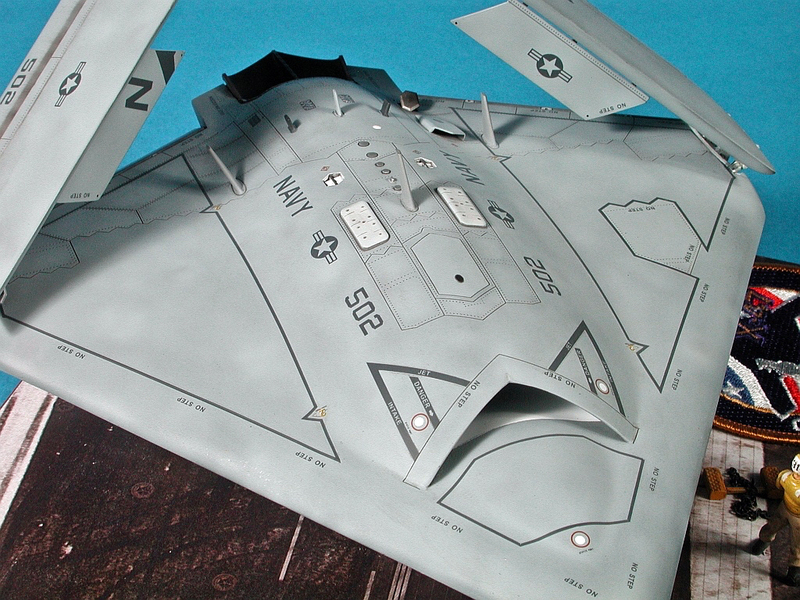 The final layout I chose to display the X-47B on the deck with tractor and figures. I think it all came together pretty well. The deck itself is another example of pre-printed cardboard by Uschi Van Der Rosten. (USS Enterprise Rectangular Version) The chains and wheel chocks are from the spares draw. So that’s my first completion for 2015. I'm really happy with how it all turned out (even the figures). 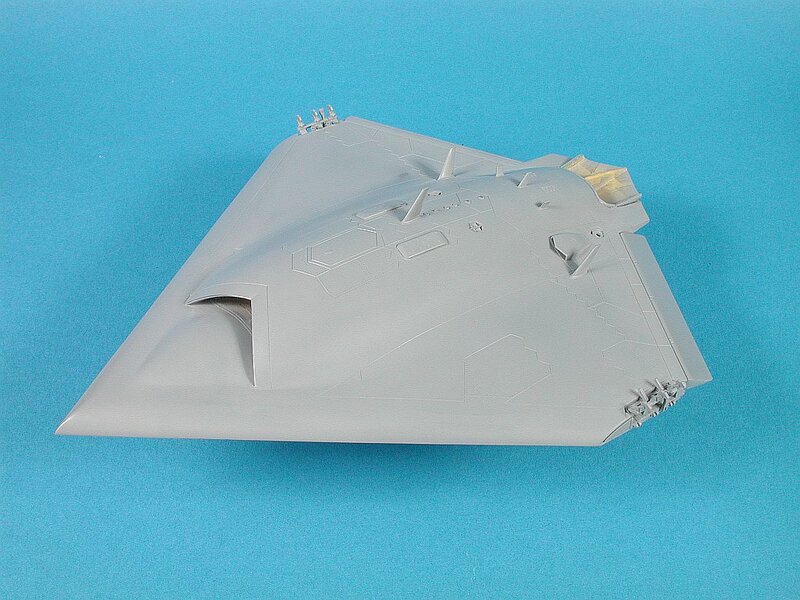 Freedom Models has done a great job with their debut kit and I look forward to seeing what’s next from them in terms of aircraft. I hope they continue how they started with subjects that are a little off the beaten track. Heaven knows the modelling world needs more variety. A very big thanks to Freedom models for sending this kit to Gary to build it up and show you..